Insisting that we are happy to do it, then complaining we have no time to do the things we want or need. No time for the kids, for friends, or even to do the laundry. Regardless of gender, family status or profession, pretty much everyone has fallen victim to this. After all, company culture dictates overtime, promotion and income depend on being seen to be a company player. For most work/life balance means dedicating an acceptable number of hours to the workplace, and sharing the remaining time out between family, friends and hobbies. However, it has reached a point at which some see it as a more substantial divide, with the early years of one’s life being dedicated entirely to work, and retirement years being for enjoyment. Some companies run on a culture of starting early and finishing late, with the expectation that staff will be there, whether or not the boss has already clocked out. Consider where this culture gets us: is anything being proven? Is it about ego and identity by activity level? Is it short-sighted people trying to assert their authority in the workplace? What exactly is reaped from long days? What do individuals sacrifice and get back out of the whole arrangement? Could it be that rather than stretch the existing team too thin, the demanding workload warrants new colleagues? Realism must be used when considering work-life balance. What would this balance mean to you? You have to take responsibility for how you see this balance and for making it happen, do not allow others to take that responsibility from you. Part of this realism must involve deciding what, if anything, you are prepared to sacrifice. Most realistic entrepreneurs understand that growing a business from nothing inevitably puts life on hold, with a widespread hope that eventually, larger sacrifices will equal larger rewards. The higher a rung of the career ladder you are on, the more is expected of you, so how do you plan to accommodate this? If your job requires you to start early and finish late, realistically the pay is unlikely to be the motivation for doing so. Is the sacrifice worth the payout you receive? In a world where the economy is constantly fluctuating, and quality of life is costing more all the time, many people feel that they simply have to invest more time in their job if they are to keep up. They fear that if they don’t make themselves known as hard workers, they could be the first out on their ear. This, again, is not realistic. During one of my coaching sessions, a senior director said, “If my staff are not carrying out their work in their given hours then I would query their capabilities. If they are staying late, I want something in addition to their expected output. Giving me the extra; I would reward”. Work-life balance is about addressing your needs and how to achieve them. What is important to you? What will you sacrifice and is it worth the payout you will receive? The Law of Balance states when you take on something new, it means something else has to give, and work-life balance is all about understanding this, committing to it and working towards it. Looking for more down-time often results in smaller income, and looking for more money often results in more hours at the office. Meanwhile, looking to start a new career involves ploughing many more hours into developing yourself, stripping those extra hours away from other aspects of your life. Although setting up a company is a huge sacrifice, the rewards can be wonderful. It is a game of give and take, and the more realistic an idea you have of what needs giving and what needs taking, the stronger a position you are in to achieve it. 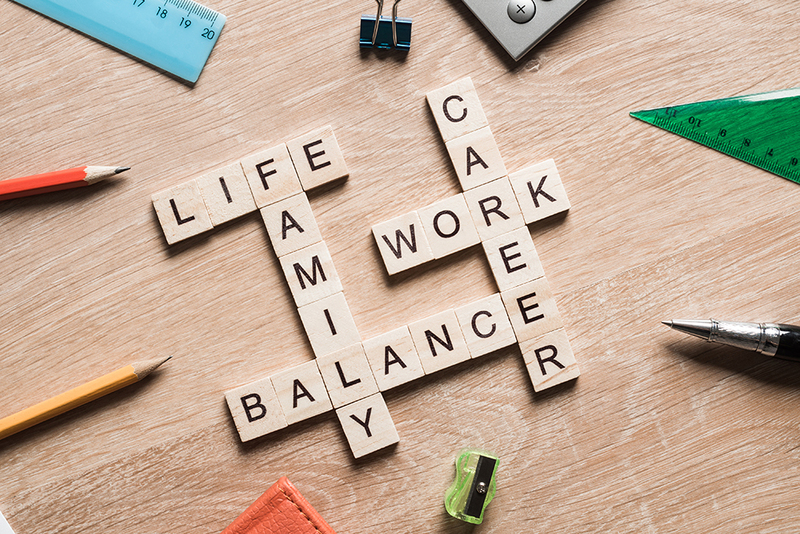 Work-life balance is not some unattainable goal, but real effort must be put into understanding what it looks like and managing obstructions you may encounter. The work emergency that warrants your attention just as you’re heading out of the door; the early morning meeting being rearranged to accommodate childcare; you must maintain flexibility for others if you expect to have it given to you. Time is one of the strongest forces working against you and your self-management and the realism with which you approach fitting everything into your working day. Everyone has the same number of hours in the day, it is down to you to rearrange to make better use of these hours. Let go of ideas of ‘the ideal world’ and approach your world with realism. Part of this realism is giving serious consideration to your work-life balance and remembering that for every new commitment you take on, you must drop another to make room. Equally, for every commitment you drop, you make time for something else. It is the choice of what to give and take that is the hard bit. Often, harder than the actual doing.